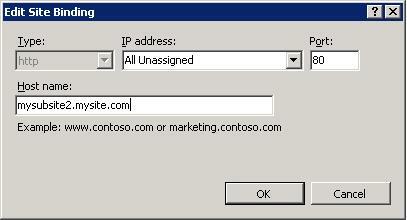 I'm running a Windows 2008 R2 box with IIS 7.5 as the web server. Now, if I change the Host name field for mysubsite1.mysite.com to blank and restart the web server, both sites work! The question is why is the host name field for the first site causing an HTTP 404 error for the second site when both sites' Host name fields are filled? I would appreciate any insight. Thank you. 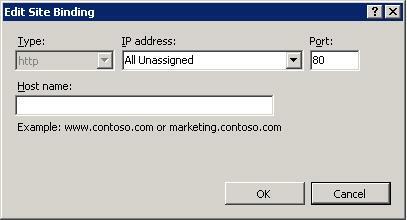 Instead of leaving the address to "All Unassigned", set it to the shared IP address for both sites. My first thought is that it's a port-error. You seem to try to connect to two different sites on the same port and that just doesn't work. Your first site, mysubsite1 uses the default http-port 80 and works fine. However, when you try to access mysubsite2 on port 80 you get an error simply because mysubsite2 doesn't exist on that port. What you need to do is to create a virtual host on a different port (8081 and upwards are often used). Not the answer you're looking for? Browse other questions tagged iis iis-7 domain ip iis-7.5 or ask your own question. IIS 8 - Site not found with localhost or IP address but works with host name?